The Galette des Rois or Cake of the Kings, commemorates Twelfth Night when the Three Kings arrived in Bethlehem bearing gifts for baby Jesus. A single porcelain fève (charm) is hidden in each galette. Epiphany's date is on 6th January but you can find the galette in every boulangerie in France during nearly the whole month. Because Ephiphany is not a Bank Holiday, it is either celebrated the first or the second Sunday in January. Epiphany is an ancient celebration for the Winter solstice called Saturnales. The tradition of the "charm" might originate with the Saturnales. The "charm" was, until the 1960s, a real dried bean, but since, little ceramic figures are used, generating a collectors' and trading business. The oldest finding of the "Galette des rois" goes back to 1311, where a chart of Robert, bishop of Amiens, talks about a custom to "draw the kings" with a light fluffy galette. during the French Revolution, the name was replaced with "galette of Equality", because there was no more kings. Another origin sustained by the Besançon's inhabitants says that in the XI Century, monks from Besançon elected their future leader by inserting a silver coin in a bread. This custom was repeated in other monasteries. The bread will become a "brioche". Hence, You can find the "fougasse" or "fougaço" in Languedoc and Provence, the "coque" in Ariège, sometimes garnished with sugared fruits or anis seeds (garfou) in Béarn. We find also "fouaces" in Perche, "flamusse" in Bresse and "garots" in Normandy, and finally "crépeaux" or "patissous" in Périgord. Once the galette is cut, a child hides under the table to give the name of the person that will be served next. According to tradition going back many centuries, the person who finds the charm becomes King or Queen for the day and wears the crown. This person must also buy the next Galette and so the game continues. The galette should be served warm and with a very dry white wine (for adults only!). If the cream becomes too thick, add a little creme fraiche. Selection of French bakeries in London, where you can buy typical Galette des rois. Maison Blanc, will not be selling Galettes this year. On 17th September, Maison Blanc announced that they were hoping to find a new buyer but alas this has not yet materialised prompting 200 of their 220 staff to leave since then. Only the old guard remains. As a result, a number of their shops have had to close given that new staff can no longer be recruited. Some of the 13 shops are still opened but are not trading as usual and are selling a skeleton of their usual range. The authentic, French, family-owned bakery has embraced the tradition of joining friends and family together on Twelfth Night (6th January) to share a slice of Galette des Rois (King’s Tart) by creating the limited edition Galette Frangipane. The golden, buttery, puff pastry tart has a soft, nutty frangipane centre and can be purchased either in a family-size that’s perfect for sharing (£16.95 serves 8-10 people) or as a mini version to share between two (£4.50). In keeping with tradition, one lucky slice of galette will have a hidden ceramic charm - so be sure to chew carefully – and a crown so that whoever finds the ceramic surprise is honoured King or Queen for the day. The large Galette Frangipane will be available in all PAUL shops and online (www.paul-uk.com) from 26th December until the end of January 2017. The mini Galette Frangipane for two is available for online ordering only for delivery within the M25 only. Enjoy the king of desserts from PAUL. 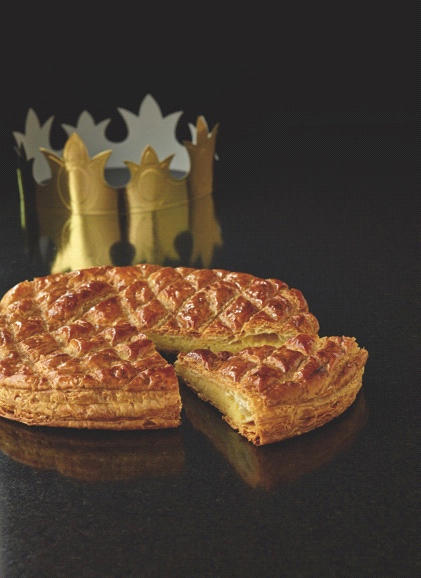 Patisserie Valerie are not selling the traditional Galettes des Rois this year. The Belle Epoque Boulangerie only do the traditional "Frangipane" galette. "This is what people like best, so why mess around with anything else" explains Mme Rousseau, the owner. When asked what makes their galettes different, she immediately respond that it is because they use the best raw products on the market. The butter used in their galette for instance is from the famous d'Isigny Ste Mère in Normandy. Mirabelle is the latest new comer to London''s gourmet scene. Shaheen is a chef classically trained in French cuisine and pâtisserie at Le Cordon Bleu Paris and at Centre de Formation d'Alain Ducasse in France. This new year she is launching her new business, Mirabelle, with the Galette des Rois! Mirabelle is inspired by her time studying and living in France and it is her effort to bring a taste of France to London. While the rest of the world gets on to diet resolutions, France celebrates Epiphany. The Galette des Rois, literally translated as cake of kings is an incredibly light and buttery puff pastry that holds a rich almond custard cream. Traditionally, the Galette des Rois has a ceramic figurine (fève) tucked into the pastry with the almond cream. Whoever finds it in their slice is crowned the King or Queen for the day. This Galette des Rois measures about 20cms in diameter and serves 6. It is sold with a golden paper crown. Please place your order at least 24 hours in advance. Available only through January. 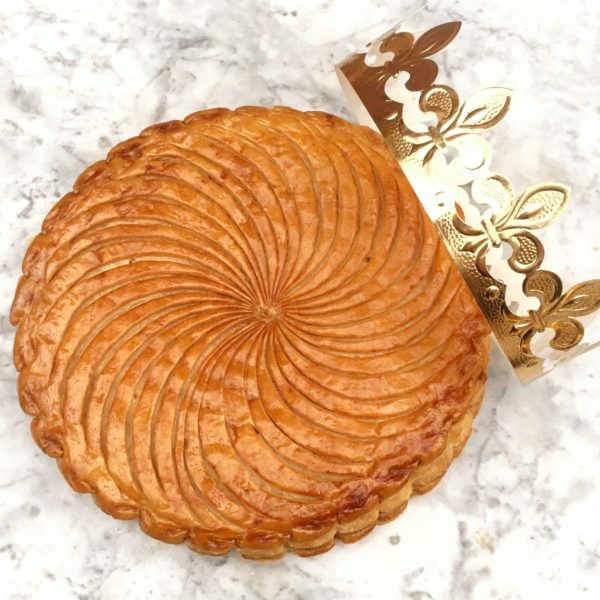 With the festive season in full swing, Dominique Ansel Bakery London will soon be debuting their quintessentially French Galettes des Rois from across the pond. Now based in New York but not forgetting his heritage, the founding father of Cronuts® is bringing a classic version of the French dessert to a wider audience following the highly-anticipated launch of his first European bakery in Belgravia in Autumn 2016. From Friday 30 December through to Sunday 22 January, as Christmas celebrations draw to a close with decorations packed up, and leftover food all devoured, there’s still one special pastry to be relished. Traditionally created in celebration of the Epiphany, guests can visit the bakery for a slice in store or take home whole Galettes des Rois to carry on the Christmas indulgence. Filled with almond frangipane and made with a flaky reversed puff pastry crust, it’s essentially a royally decadent almond croissant in cake form created to see in the New Year. Each comes complete with a fève (small prize) and a golden paper crown; whoever finds the fève can be crowned the winner and declared King for the day! Guests can also pre-order whole Galettes for pick-up in shop. Other seasonal offerings include an update on the classic Mont Blanc for winter, with chestnut cream accented with rose and cassis for a fruity floral note, served on a salted butter cookie and finished with vanilla meringue on top. While Christmas would not be complete without the Bûche de Noël, and Dominique has created two distinct flavours: a Chestnut Whiskey with almond biscuit, chestnut mousse, a dash of whiskey, and candied chestnuts from Aubenas and a delectable Double Chocolate log. Originaire du Var mais exile9e en Dordogne (of9 on mange bien, certes !!) quache anne9e e0 l'Epiphanie, je repense au ge2teau des rois de mon enfance, exactement celui fait par ta maman, je n'avais pas la recette exacte mais je m'e9tais promise la trouver et de faire gofbter cette pure merveille e0 mes enfants...Merci Fabienne d'avoir partage9 avec nous cette recette de famille. J'ai fait ce ge2teau hier soir, non seulement toute la famille s'est re9gale9e ce matin (pour ma part, je n'ai pas re9siste9 e0 la tentation de8s sa sortie du four malgre9 qu'il soit 23h...) mais ce fut un bonheur de de9tente de le faire c'est un de9lice, toutes mes fe9licitations e0 ta maman. Je tiens la recette et je ne la le2che plus, j'ai retrouve9 ma madeleine de Proust en mieux car faite maison. merci pour la recette gallette des roi. how do you actually use that much butter for the recipe? You can now order your galette des rois in London and pick it up at Le Montmartre on Fleet street. voila une petite histoire qui vous remet le sourire aux levres !!!!! Memoire permanante d'une galette des Rois. Deux jolies femmes dans un bistro parisienne le 6 janvier 2004, assise au bar. Elles demandent chacune une trance de galette des Rois. Une decouvre "la feve". le barman lui donne deux chapeaux de papier et demande, "choisi votre roi!". elle coiffe son ami avec le chapeau et tout le restaurant tombe en silence, pas un mot. "je suis le roi et ma copine est ma reine!" "Mais ce doit etre un homme, Madame!" "Qui dit?" dit la dame, "nous sommes en 2004!"